With the retirement of US Freedom Head Coach Wayne Kraska, the USAFL is embarking on a search for a new head coach to lead the US Freedom to the first Women's International Cup in 2011. Saturday, October 23, 2010 – The United States Australian Rules Football League is excited to announce their participation in Movember 2010. During the month of November, male players from across the country will grow mustaches to raise money and awareness for prostate cancer. Teams within the USAFL will compete to see which club and individual can raise the most money, and most importantly, who can sport the best Mo’. Fact: In 2010 tragically more than 32,000 men will die as a direct result of prostate cancer. THE AFL has announced that Peter Schwab has been appointed as the new AFL Director of Coaching. AFL General Manager National and International Development David Matthews said Schwab would commence his new role in the AFL’s Development Department in early December after he completed his duties as chief executive officer of AFL Victoria. Wednesday, October 27, 2010 – The United States Australian Football League (USAFL) is pleased to welcome its 2011 Executive Board and Program Coordinators. During the 2010 Annual General Meeting (AGM) at Louisville, Kentucky four new board members were voted in. “I’d really like to thank the outgoing board members for all their hard work and dedication to the league,” said Rich Mann, USAFL President, “particularly long time board member Matt Jagger who has been on the board since 2006 as Secretary and will continue to contribute through his role as Team Manager with the USA Revolution squad”. The adage is that, "All good things must come to an end". 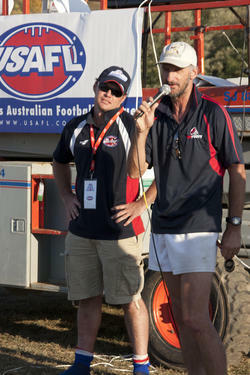 One of those good things ended at the 2010 USAFL National Championships. US Freedom Head Coach Wayne Kraska announced his retirement from the USA Freedom. Prior to and during his reign as Freedom coach, Kraska built a dynasty in Atlanta where he coached the Lady Kookaburras to wins in the first three USAFL Women's National Championships (2005-2007). During this period, Kraska was integral in coaching and developing some of the league's most competitive players. In fact, the Kookaburras did not lose a game until they were narrowly defeated by Calgary in the 2008 Grand Final.